This menu add-on will enable the abliity to do QR provisioning from IOS or android Zoiper app. Zoiper has designed the process in a way that is cross platform. Fusionpbx has the ability to click the extension you want to provision and a link wil open to either download the app on multiple platforms or if you have the app installed on a mobile device you can use the QR code scanner to scan a QR image and the mobile is ready to use. There are two parts to make this function. http://oem.zoiper.com and Fusionpbx menu add-on. 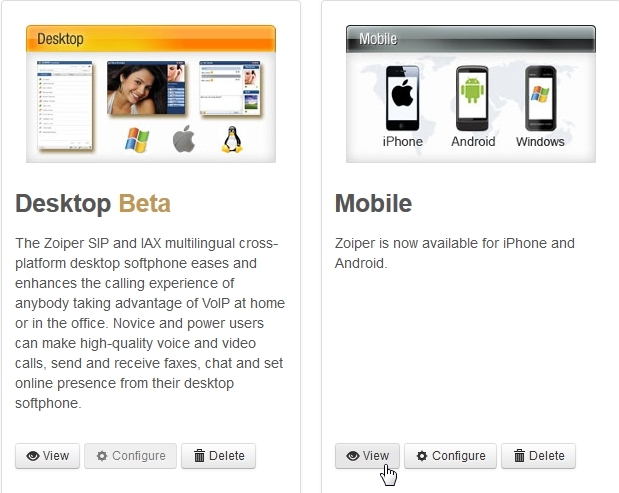 This all adds a one-click install for both the Desktop and Mobile Zoiper APPs in the User Portal. The page is accessible by end users. This can be done with the FREE Zoiper OEM account or can use the paid versions for more customization like branding. 3. Configure your Desktop and Mobile Apps with the information you want. 4. Then click “CONFIGURE” Under Desktop. 3. Menu Defaults and Permission Defaults. Note MYPAGEID and provider_id are two different sets of characters. You can also find these by going into the oem.zoiper.com login and click “view” on the moblie section. Add a link on your website to this step by step tutorial on our website : (**click here** to see it in action). Users will only see the extensions assigned to them. Click on a link and it will take you to the Zoiper Site. Follow instructions there to download and install.